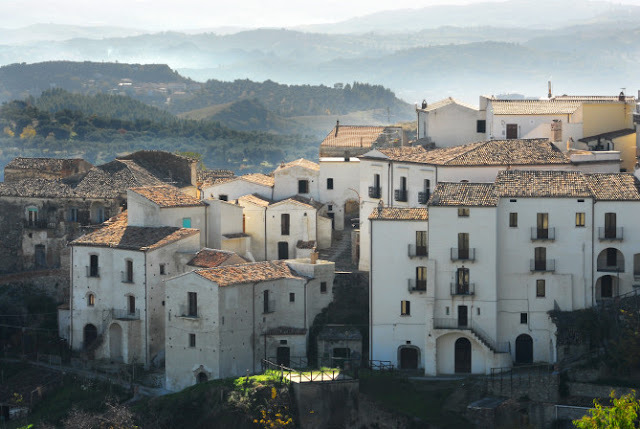 Things have changed in recent times and a modest degree of prosperity has arrived and even isolated Basilicata is starting to appear on the tourist trails. The recognition of Matera, one hundred kilometres to the east, as one of two European Capitals of Culture for 2019 accelerated the process. Despite the winds of change, the locals still remain very connected with their past, particularly at Carnevale when the clock winds back and the men dress as diabolical, mythological animals and stalk through the town, filling the streets and lanes with shouts, drumbeats, bells and the squeals of children. The choreographed rituals and costumes of Aliana’s Carnevale reach back to ancient Greece when southern Italy was part of Magna Grecia and Pan and Dionysius walked the rugged mountains. The festivities start two weekends before Shrove Tuesday (Martedi Grasso – ‘Fat Tuesday’) the last chance to indulge before the forty days of privation for Lent, which this year is March 5. Basilicata is a surprisingly beautiful and diverse region. If you have a car, Aliano is a good base from which to explore the ‘deep south’: 50 km south to the Ionian Coast; 45 kilometres west to the mountains of the Pollino National Park; 100 km east to Matera; and 150 km north to the rolling wine country around Venosa. Palazzo Scelzi (Via San Luigi Gonzaga 1, Aliano; www.palazzoscelzi.it). This very comfortable B&B is in a handsome 17th-century palazzo in the centre of Aliano and offers single, double and triple rooms, all with en suite. A double costs 60 euro per night. Palazzo dei Poeti (Via Manzoni, Tursi; www.palazzodeipoeti.it). This gorgeous, family-run 3-star hotel is in a loving restored palazzo at the foot of an ancient castle in the neighbouring town of Tursi, which is famous for its excellent restaurant. Double rooms from 90 euro (dinner around 35 euro per head). Agriturismo Antico Mulino (State Highway 598, Missanello; www.agriturismoanticomulino.it). Based in a restored mill dating from the 1600s, this simple but comfortable is set in the country a short drive from Aliano. Its very good restaurant serves traditional local fare such as pasta with wild boar ragu. Doubles from 60 euro per night. Dinner 15 euro per person. Taverna La Contrada Sisina (Vico Stella, Aliano). This small family-run trattoria in the centre of town presents honest, local cooking including frizzuli (a rolled short pasta) with ragu and legume soup. It is also a B&B. Double room from 50 euro. Dinner around 20 euro per person. La Locanda con Gli Occhi (Piazza Garibaldi, Aliano). Another charming local restaurant, this time set in the restored cellars of a palazzo. Their specialities include ‘rafanata’, a Baslilcata classic (a type of frittata prepared with horseradish roots, potato and cheese) and cavatelli (a stumpy shell-like pasta cooked with peperoni cruschi, breadcrumbs and cacioricotta cheese. Villa Argenzio (State Highway 598, Missanello). Set in the country in the foothills of the Pollina National Park, this large restaurant offers traditional home-cooking such as frizzuli with ‘peperoni cruschi’ (local bell peppers) and bread crumbs; chicory soup and roast lamb with truffles. Around 25 euro per person. For such a small and remote town, Aliano has a quite bit to offer. Most importantly a number of sites dedicated to Carlo Levy, a Turin doctor and talented painter who was sent into exile here by the Fascist government between 1935 and 1936. The book he wrote of this experience, Christ Stopped at Eboli, is without doubt one of the finest pieces of Italian writing of the twentieth century. Written with the eyes of a scientist and the heart of an artist, this deeply compassionate work through light on the international spotlight on the hardship and poverty that the people of this region suffered. The Carlo Levy Literary Park organises numerous initiatives throughout the year, while the excellent Carlo Levy Museum and Gallery presents correspondence, drawing, lithographs and paintings by the great man. Casa Levy, the small house where he lived during exile has an interesting multimedia display. The nearby is a museum dedicated to local farming history and traditions (including a collection of Carnevale masks), while the Museum of Abstract Art, in the historic Palazzo De Leo, is dedicated to the work of Paul Russotto, an American abstract expressionist who had ‘alianese’ origins. Less than fifty kilometres west of Aliano is the magnificent Pollino National Park, the largest national park in Italy, which covers the southern ranges of the Apennine Mountains, spreading across southern Basilicata and northern Calabria. The gorgeous village of San Costantino Albanese (population 800) is in the heart of the national park, an easy one hour (53 kilometres) drive from Aliano. It has a fascinating history being founded in the 16th century by Albanians fleeing the Turkish invasions. In their isolation, they have maintained many of their traditions and Albanian is still the local dialect. A number of easy walks in the national park go out from here – best to take a guide though: two authorised guides based in the town are Alessandro Cellini: mobile: +39 349.5162018; e-mail alessandro.cellini@outlook.com and Quirino Alberto Valvano: mobile: +39 340.4110651; e-mail vuzak@tiscali.it. If you have more time to explore, Viaggianello, another small town in the centre of the park, 1.5 hours drive from Aliano, is a wonderful based. There are many walks leading out from here and there is a wonderful 4-star hotel: the Castello dei Principi (www.castellodelprincipe.it, a Norman castle overlooking the town with spectacular views). For more details on the park, contact the park website: http://parcopollino.gov.it. Matera, one hundred kilometres east of Aliano, sits above a ravine pock-marked with deep caves that have been inhabited since the Palaeolithic period. Matera is, in fact, one of the oldest continually inhabited cities in the world. In the early 1950s, this small provincial capital was thrown into the national, and international, spot-light as ‘the shame of Italy’. The problem was that a large proportion of its population still lived down in the ravine, in extreme poverty in the same cave dwellings that their Palaeolithic forbears had inhabited and with services that hadn’t improved much since then: no electricity, no running water, no sewerage. For a large part of the town, the infant mortality rate was over 50%. Matera became a ‘cause celebre’. The numerous families were forcibly moved out of the Sassi (the Rocks) and into modern apartments that had been purpose-built. For twenty-five years the intricated network of underground houses, frescoed medieval cave churches and twisting lanes and stairways that formed the Sassi lay in ruins, neglected and silent until someone realised what an extraordinary they were. Today, the Sassi have become the pride of the town. They have been completely restored, filled with shops, museums and even a couple of quite unique five-star hotels. The Sassi now form one of the most fascinating sites in southern Italy. To cap the fairy-tale, for all of 2019, Matera will be the European Capital of Culture, with the Sassi as the highlight. Matera and the Sassi can be comfortably visited in a day. It is quite possible to visit them on your own but, like Pompeii, the experience is so much richer with a good guide. If you are visiting on your own, we’d suggest parking in Via Santo Stefano and walking into the lanes of Sasso Barisano, one half of the Sassi, which has striking views down over the Gravina (the ravine under the town). The must-sees in this area are the small church of San Pietro Barisano; the Casa Cava cultural centre; the Casa Noha, where an impressive video-installation tells the history of Matera and the cave church complex of the Madonna del Virtu and San Nicola dei Greci (where an exhibition dedicated to Salvador Dali will be hosted until 30 November). From here you can climb out of the ravine to the flat to Piazza Vittorio Veneto, the centre of the town, a large square surrounded by Baroque architecture where the great and good lived. From here it is a short walk to Piazza del Sedile (a good place for lunch, listening to the music from the Matera Conservatorium, which faces onto the square) and Via Ridola, a busy pedestrian street lined with a number of cafes and restaurants as well as the excellent National Archaeological Museum. From Via Ridola you can take stairs down into the other half of the Sassi, the Sasso Caveoso, the oldest part of the city. The highlights of this section are the cave churches of Santa Lucia alle Malve and Santa Maria di Idris, which have an extraordinary series of Byzantine-style frescoes dating from the fourteenth and fifteenth centuries (painted by Albanian and Greek monks who had crossed the Adriatic Sea to Italy, fleeing from Turkish invaders). If you are feeling adventurous, you can follow trails from here into the ravine to explore the caves and cave churches on the opposite side.